Tear jerker…inspirational…what a tribute! I love that your mom saw in you your talent. She made sacrifices to make it all happen being sick and all. No wonder you do so many amazing things, you were LOVED and shown how to love! I love you. I love your podcast and how it inspires me! I LOVE YOU, Mindy! And I love what you said: I was loved and shown how to love! It’s so true! I am one blessed woman! This was a beautiful episode. I listen to you on my Monday morning runs, and found an extra pep in my step (run?) as I listented to your beautiful voice. Today’s podcast encouraged me to pat extra attention to my daughter’s talents and seek a way to let them shine. Thank you! I am honored to think that I get you through morning runs! You go, girl! And thank you so so much for your kind words! 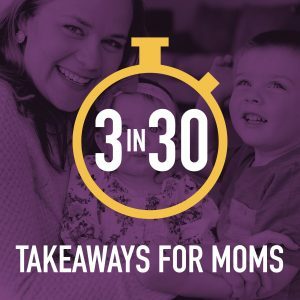 These podcasts are amazing and I am sure they are helping and blessing the lives of many young moms, as well as lots of us older, “been there, done that”, grandmas. This one was particularly wonderful for me to listen to since I have had your dear, sweet mom on my mind a lot lately knowing that it would be 15 years this month. I remember very well so much of what you talked about and I also still have that fantastic CD, which I listen to often. She did a remarkable job as a mother despite all of the health challenges she faced for so many years. She raised three exceptional women (along with a little help from your dad 😉). She was a blessing in many lives, including mine. She was so much more than my sister-in-law. She was my dear friend and the closest thing to a sister I have ever had. I’m sure she is immensely proud of you and Sarah and Laura and the way that all of you are mothering your own little ones. Thank you for sharing this intimate piece of your soul. It feels like forever and only yesterday. I loved hearing your singing through my speakers today. You conjured precious memories. Thank you for the advice to provide tangible reminders for our children of how much we love them. Alma, it does feel like forever and only yesterday–such a perfect description! 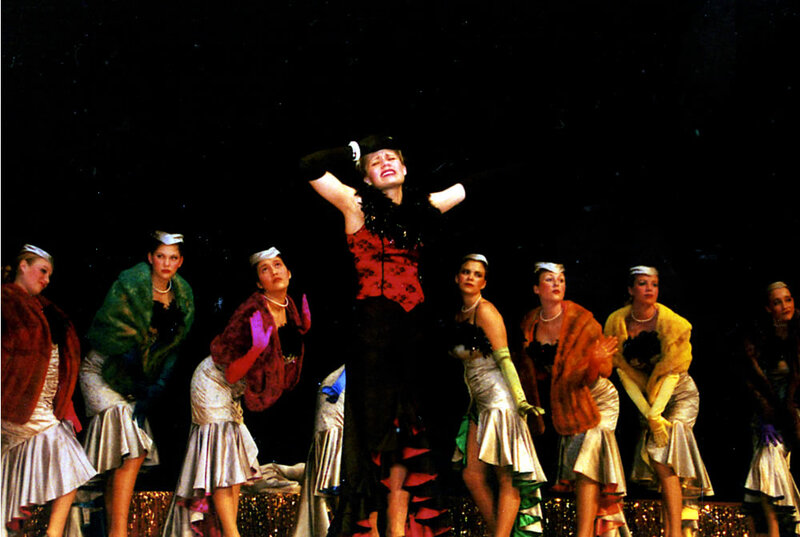 It’s been about 20 years since I started with Ursula. What?? Your family will always have such a special place in our hearts. Truly, you all were a major anchor to us through those years. Love you and hope to hear your amazing voice soon! Rachel, Oh how I love and appreciate all of your podcasts!! They brighten my days and inspire me to try harder as both a mother and grandmother. You teach me so many, many helpful skills in concise, easily remembered, applicable steps. 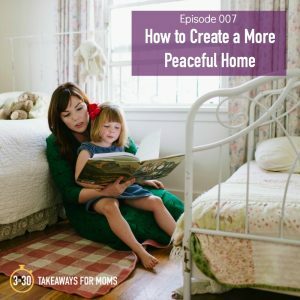 Your podcasts bring me closer to our Lord in our sacred responsibilities as women, wives, daughters, sisters, mothers, grandmothers, and friends. Your voice is gorgeous!!! Please share more!!! This podcast was such a beautiful tribute to your mother and captures a bit of your beautiful relationship with her. I miss my Mom so much and you helped me reflect back on special times I had with her. I wish I could give you a big hug, meet you in person, and be your neighbor! Please keep doing what you are doing and being YOU!!! You are making an important, impactful difference in my life and I can imagine also in hundreds of other’s lives! Your children, Sally and Noah, both are SO blessed to have YOU as their momma!! I’m also an adoptive mother of one special needs child and have also given birth to 5 of our children. It’s not easy, but you encourage all of us! Marie, this was one of the most thoughtful, most encouraging comments I’ve ever received. THANK YOU for taking the time to reach out and for all of the little gems within your sweet comment–like reminding me that my mom is leaving real stars shining on my door. That brought tears to my eyes!!! I would also love to meet YOU and have you be my neighbor! Where do you live? I am speaking at a workshop in Draper, UT on Sept 28th and one is Henderson, NV on November 17. Is either close to you?? Perhaps the most meaningful part of your comment was this line: “Your podcasts bring me closer to our Lord in our sacred responsibilities as women, wives, daughters, sisters, mothers, grandmothers, and friends.” That means so much to me because sometimes I feel so unworthy of being an instrument, especially because my “spiritual habits” haven’t been steady in the past 8 months since I started my podcast. Life has gotten BUSY! But I am constantly working on it, and I know that’s what matters to the Lord. I can’t thank you enough for your encouragement. Sending love!! I wish I could hear you talk live. I live in Spring, TX right now, but we are looking for our retirement property and home right now somewhere in MT, WY, or ID. We want to live near our children and grandchildren but they are all spread out in different states and none of them in a long term job or location yet. Family is most important and precious! We are hoping to find a home with a few acres, view of the mountains, pond, fruit trees, and lots of room for grandchildren to play and friends and family to gather and all of us to make memories together. I think that you could include the time you spend researching for your podcast, interviewing, writing, editing, and even writing responses to comments as all part of your “spiritual practices”!! You are definitely putting your mind and heart on the Lord and keeping your heart soft to receive His guidance. You act on those promptings and are definitely an instrument in His Hands bringing people closer to Christ! You teach us all how to be more like Him in our many roles. I suspect that you often learn things and you often mention that you try harder because of something a guest said or taught. That kind of deep learning can come from studying scriptures, inspirational talks, prayer, pondering, journal writing and reading, and also by talking with others who have wisdom to share. Wouldn’t all of these be “spiritual practices”, even though they might look a little different than you used to do before starting your podcast? I try to remember that there are different seasons of our lives when it works better to draw close to the Lord in different ways. Jesus showed us many, many ways He drew close to Heavenly Father. I think Satan likes to try to find any way possible to discourage us, bring us down, distract us, and drive us from serving the Lord. There are so many, many ways to serve the Lord and to minister to others. Just think of the many lives you touched as you and your husband taught children in your community dental health! That is teaching them to take good care of their bodies! Perhaps you can pat yourself on the back for the many different ways you are drawing close to the Lord in new and different ways! I want to hug you for all the many ways you are helping me stretch, learn, and grow closer to Him!!! Go Momma, you’ve got this!!! Keep up the AWESOME ministering work!!! Again, you astonish me with your incredibly kind comment. Thank you so much!! Your comments are getting printed and put in my journal! Thank you so much for the reminder of all of the many different ways we can minister and draw closer to the Lord. You have been an answer to my prayers. I am in Hailey, ID. There are properties like what you describe around here for sure! I don’t know much about WY or MT, but I hear that both are beautiful. Let’s keep in touch! Email me directly if you’d like to. 3in30podcast@gmail.com Much love to you!! Dear Rachel, it’s taken me a little longer than I would have liked to find the peace and quiet I knew I would want to have while listening to this particular podcast. I love everything about it; your beautiful voice, beautiful heart and beautiful mother. What a blessing and inspiration you both have been to me. About a month ago, as I was purging to get ready for our move I ran across a copy of the talk you gave, Love At Home, and read it from beginning to end. (i must have asked you for a copy. I don’t remember asking but I do remember you giving it and your heartfelt sentiment and sweet spirit). As I listened to your podcast i thought it was kind of ironic that I would have read that entire talk recently. Once again, inspired by you. I also will never forget you and your sisters singing that beautiful rendition of Love At Home. I remember sitting in front of your mom that day and visiting with her afterwards. I was so happy she was there. As you can imagine, I’m excited about our move to Asia but struggling with leaving children, grandchildren and my aging parents behind. Your thoughtful messages have given me pause and time to reflect on how I can best continue this mothering journey from afar (because it never ends whether we’re here or in the other side of the veil. How grateful I am for that). What a beautiful, heartfelt comment, Stacey. THANK YOU! And I can’t believe you recently found that talk from my mom’s funeral! Inspired! You, too, have been a great example to me, and I am going to miss you terribly when you move away. You have always poured out your love on me. Thank you. I recently stumbled upon your podcast and I’m SO thankful I did. I wanted to thank you for this beautiful episode. I am new to motherhood and learning. Two years ago, I married my husband and I was blessed with 5 amazing step children. I had no children of my own at that time, so I just jumped in and did the best I could. 10 days ago, I had a baby boy and I’m now experiencing motherhood from a different angle! Last evening, my grandmother (age 91) peacefully transitioned from this life to the next. All of that to say, I have been reflecting a lot over the last week or so. 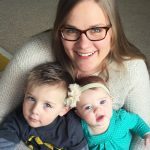 I have been wanting to be more intentional in areas of motherhood and the impact I’m having on all of my children. I’ve been thinking about my mom and my grandma’s and how they left legacies for me. To hear about your mom and her beautiful life was so inspiring. I love that she wasn’t a journal keeper, because I’m not either. 🙂 I was inspired to hear about the other ways she touched you and left her mark. Thank you again for sharing. Ps. I absolutely loved hearing your songs as well! Bre, what a beautiful and unique journey to motherhood, which I’m sure has been full of so much growth. Congrats on your new baby! 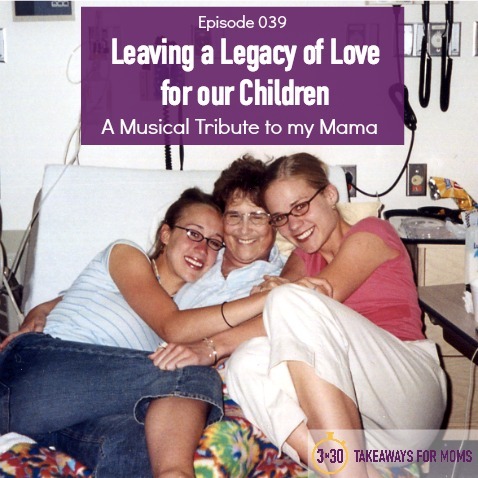 It is a true honor to know that my mom’s story has inspired you in your own motherhood legacy. Keep up the amazing work! Thank you so much for listening and for taking the time to come here and comment!! 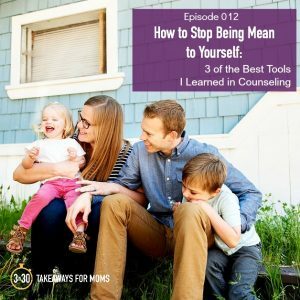 Rachel – I love this podcast of yours and what you’re doing to empower, inspire and encourage striving mothers! And I LOVED this episode about your amazing mother – everything about it. What a beautiful way to honor her on this anniversary of her passing. 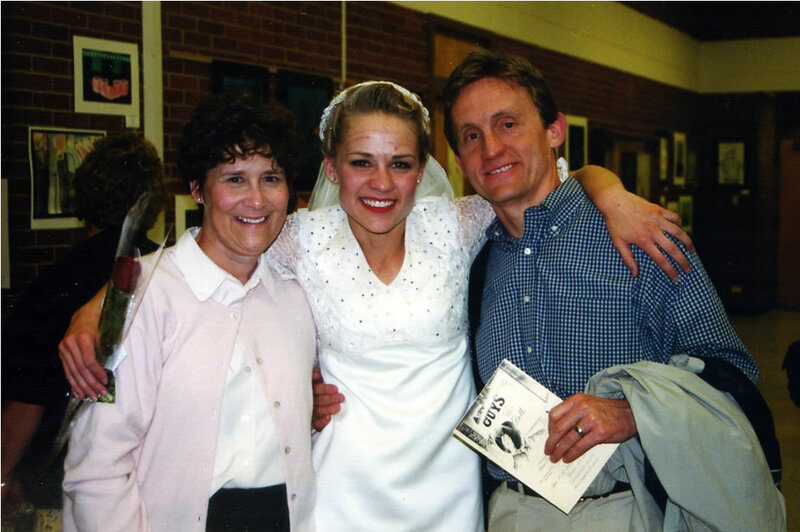 I love your mother – and I still have a card she wrote to me when She was my young women’s leader. She definitely made an impact on my life during those challenging young teenage years. It was so fun to hear my mother’s name in there too (in your moms note to you)! How sweet that my Moms experience was helpful to your Mom at that difficult time. In turn, Your family’s experience and empathy was such a strength to us as we lost my Mom to cancer years later… and your dad was a huge anchor for us – in fact he still is for my dad. They just went to lunch together a few days ago :). I always enjoyed hearing you and your sisters sing. I still remember you three singing “Love at home”. Heaven felt so near when you sang it at her funeral – It was a tender experience to be there. I’ve aways looked up to you and I’m glad I can learn from you through your podcasts! Thank you so very much, Summer. And I am so so sorry for your loss. Losing a parent is excruciating. It means a lot to know that I’m not alone, and that others who listen to my podcast have also lost parents and grieve with me. I would love to hear what kinds of tangible reminders of love you decide to start incorporating into your life with your kids! So much love to you. I ran into a friend of yours at a Women’s Conference in Hong Kong. She told me about your podcast. Then my sisters sent me the link to this one. Loved this! You wove your story in so beautifully with your music. Wow. Thank you for sharing!! Thank you so much! I assume it might’ve been Betsey Hawkins that you met? Or possibly Chelsea Fischer? Both amazing women. 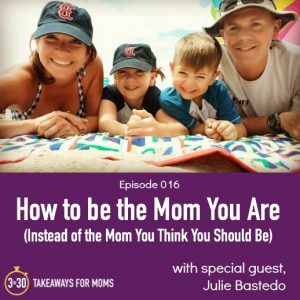 I feel so honored to know that my podcast is being shared with incredible moms all over the globe. Thank you so so much for listening. Rachel! I stumbled across your podcast a few days ago. 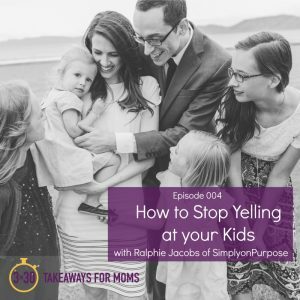 The first episode I listened to was with Ralphie from Simply on Purpose, and I thought to myself “I recognize this host’s voice!” I was able to put it all together, and was so excited. We were only in your ward for a year in Twin, but it was long enough for you to leave an impression on me. Thank you for sharing such sacred stories and experiences. 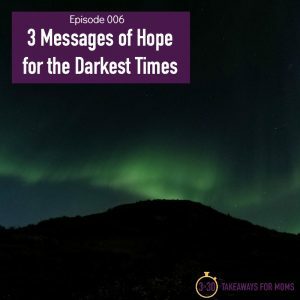 I lost my dad to Multiple Sclerosis 13 years ago, and so many parts of this podcast expressed similar feelings and takeaways that I have from my father’s life. My sister and I now both listen to your podcast and share with each other what we loved best. Delta! Hi!! So glad you found me here! I am so so sorry to hear about your father. That is so difficult. Ralphie has done two episodes on my show–did you listen to both? You might particularly be interested in the one with Ralphie and her dad who has MS. It means so much to me to know that you and your sister listen to my podcast! Are you a mama now?? I’ve listened to the episode where both she and her dad were on the show. It was so good, definitely a tear jerker. 🙂 Yes, I am a mama now to a little 18 month old girl! Motherhood is such an adventure, I wouldn’t trade it for the world! Hi Rachel! I LOVED this episode! Today my mom would have been 68, she passed away, unexpectedly 5 years ago from a rare disease. She was one of my best friends and I miss her everyday. I loved your take aways. I’ve been thinking a lot about how I can teach my daughter (8 months old) about her Memaw and what type of mom I want to be. Thank you for sharing your story of her and your thoughts! Thank you so much for listening!! I am so sorry to hear that you’ve lost your mother too. It is so so difficult. I know you will do a great job honoring her and teaching your daughter about her. Much love. I cried my whole commute from work to home! This episode really touched my heart! What an amazing mother you had thank you so much for sharing her with us! You also have an incredible voice. Truly such a touching episode. This episode inspired me to keep up with the little details that show my love. I hugged my girls extra tight when I walked through that door. Thank you! THANK YOU SO MUCH!!!! This means the world to me.